To start, we know your first two published books were very successful! What are your hopes for your newest release Happily Ever After? Linda: We hope that we can get into the heads of many couples who are motivated to take a deep look at their belief systems. We want them to see whether the beliefs they are basing their relationships out of are really serving them or maybe inhibiting them in some way. We’re all about going for the gold. If we’re in a relationship, we might as well have the greatest relationship we can have. And we think really looking at some of the ideas we have and the myths that are popular in our culture is a direct avenue to having a finer, more fulfilling relationship. Was it something in your mutual experience as psychotherapists and counselors, your personal lives, or another inspiration that led you to choose the angle of relationship myths? Charlie: We’ve been doing the work for quite a while. It just seems in the last few years we’ve come upon a lot of people who are making decisions about their future in terms of relationships and marriage that are based on assumptions that we have found aren’t always necessarily true. It seems to be an increasingly large number of people who are buying into certain cultural assumptions and beliefs about relationships without really checking them out. We decided to collect what we came to believe are some of the more prevalent, popular beliefs and myths. Our hope is really that people will just begin to be a little bit more open to questioning the possibility that this isn’t necessarily always true. What is the biggest relationship myth that people often believe? Why is it so often thought to be true? Linda: We call the book Happily Ever After because we all grow up with these fairy tales. The prince and princess stories, the Cinderella stories, where you finally find true love and walk off into the sunset together. It’s such a romantic myth and it sets up people for so much disappointment. It’s not realistic to think that you’re going to be happy all the time. Even the happiest people get the blues. Even the happiest couples sometimes have an argument and every couple, if they’re together long enough, is going to hit a rough patch. Maybe a big rough patch. This is the one we lead with because we want to introduce the reality right away. Especially to the young starry-eyed couples who expect to always be so starry-eyed. That fading effect is going to happen and you have to be more purposeful about keeping the relationship cleaned up. Our marriage advice is to have apologies and forgiveness ready if you have an argument. There is some work that needs to be done periodically for the relationship to be a great one. One myth that you disprove in your book is, “Love can heal all wounds.” Why isn’t this idea true? How can believing it hurt your relationship? Linda: Love is an extremely powerful force. It can take us quite a long way, but this is another one of those leaps that can set us up for an expectation that’s going to be bashed because even if the person that we’re with loves us a great deal, we may have experiences where we lose something and it’s a deep, grievous loss. Losses can be very horribly painful and our partner can certainly be there for us. Certainly they can listen to us, they can let us cry on their shoulder, but we have to do some of the work by ourselves. Just because they love us doesn’t mean that heals it. We have to be proactive about learning from those downfalls, about learning how to repair after there’s been a nasty argument when we said things that we didn’t really mean. So it takes some skill in addition to the love and it takes a lot of love to get people motivated to get their skill level up. What expectations, if any, should individuals enter a marriage with? What crosses the line as being too high of an expectation? Charlie: I don’t think there’s anything wrong with having expectations as long as you’re willing to take a certain amount of responsibility for having them come about. So for instance, if you have the expectation that you’re going to be taken care of by your partner in every way after you get married, I think you’re probably going to be disappointed when that doesn’t happen because one of the myths in the book is that my partner should be able to fulfill all of my needs. Some people do go into a committed partnership with that expectation and that is inevitably going to lead to disappointment because there is no one person, no matter how much they love you, who is capable of providing for all of your needs. So, expectations themselves are not the problem. What I would say can be a problem, and this is related to expectations, but is a little bit different, is entitlement. Entitlement means that I have a right to expect you to provide this for me. That’s my inherent right. I can do that, I’m entitled to it. That is something that is doomed to disappoint. “Once a cheater, always a cheater.” How do you justify this idea as being a myth? If a partner cheats on their significant other, how is the relationship supposed to return to its former state? Is this even possible? Linda: We have met many people over the years who in their sub-consciousness, or their immaturity, or in their self-indulgence broke their fidelity vow and they cheated on their partner. They may have lied about it and covered it up, but eventually they did come clean. It’s always easier if they volunteer the information and confess rather than being sought out. But couples can learn from their downfall because this is one of the really painful things that some couples have to go through. It’s actually rather common, that at some point in the decades of the marriage that one or both of the people are going to stray and break their fidelity vow. It’s the belief that the damage could never be repaired that really finishes a relationship off. We want people to take a look at this and see if this belief is in them, whether there’s any openness to possibility. If you can avoid it, do that. But if it happens, at least be open to the possibility that a full recovery can take place and then some. Did your relationship inspire the inclusion of any particular myths in Happily Ever After? If so, what one? Charlie: There’s a lot of the myths in the book that I think one or both of us have bought into to some degree. It’s pretty hard to live in this culture and not absorb some of the beliefs that are prevalent, particularly when they are reinforced by a lot of other people. Some of them are used in popular culture, in movies, in songs. Linda: I thought that telling the truth meant I wanted to have an honest relationship. I didn’t want secrets and lies, so I was committed to an honest relationship. But the way I went about speaking some of my truths was not very skillful. I was run by the belief that I had to express my anger as if holding that anger in was going to explode like a pressure cooker. I was unkind, unpleasant, and rude. Sometimes I cursed and threatened and did things that caused harm to the relationship under the guise of ‘I’m just being honest.’ It took me a while to get past this belief because I didn’t want to repress myself and be inauthentic. I realized this belief was making a mess of my life and damaging my relationship. People were afraid of me. But there is a way to be honest and it’s not a lack of genuineness; you can be genuine, you can be authentic, you can be honest, and you don’t have to cause harm with your truth telling. Now for some love advice! In your 44 years of marriage, what’s the best piece of relationship advice you’ve received? Charlie: Three words: Hang in there. Because an awful lot of people, when the going gets rough they tend to bail out before they really give it their best shot. I’m not saying that every single relationship can or should work. There are some that are just plain mismatches and they’re really not meant to be. If you’re giving it your best shot, you do hang in there, things don’t change, and it really starts to erode your well-being then it is time to take a step back and take a look at whether this really is something that you need to reconsider. But more often than not, people don’t hang in there long enough to really turn things around. Sometimes they may quit just before the potential turning point comes up because sometimes we have to sink down. So what we often encourage people to do is to see if you can just hang in there a little longer to see if things can turn around. Hang in there. That’s a piece of relationship advice that I think can serve a lot of people. What would you consider the greatest adversity that couples experience today? How can they overcome it? Charlie: We live in a culture that doesn’t really support relationships as much as they need support. There’s a saying that it takes a village to raise a child. It also takes a village to raise a partnership. I think it’s a great adversity to many of us that there isn’t enough necessary support for people who are really trying to create a healthy, successful, fulfilling relationship. We seem to put more value on the material side of life and that is very unfortunate. When you don’t have a fulfilling inner life and you don’t have a fulfilling interpersonal life then you’re going to be much more inclined to seek out material success and money and ego. We need to recognize and accept the natural human tendency to seek and need deep connection with other people and not get pulled into the cultural myth that material, financial success is going to lead to greater happiness. For more on Linda and Charlie Bloom visit Bloomwork.com. 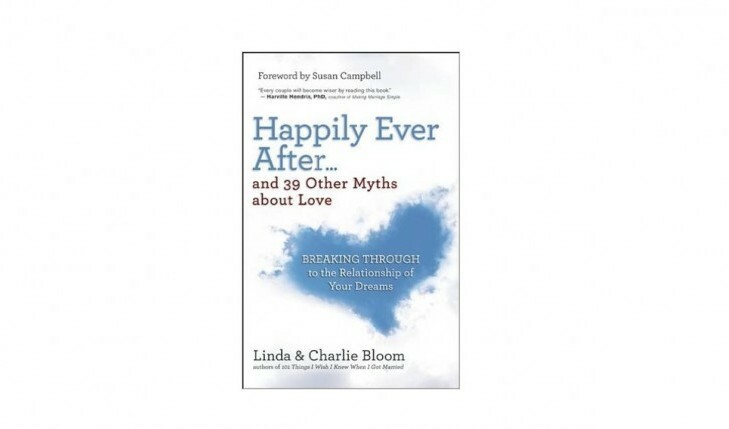 Happily Ever After…And 39 Other Myths About Love: Breaking Through to the Relationship Of Your Dreams is now available on Amazon.